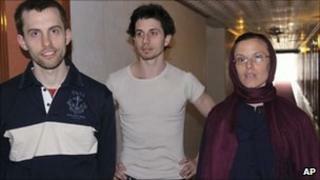 Iran has postponed the trial of three American hikers who are charged with spying, the judiciary spokesman says. The trial was due to start on Saturday, but could not go ahead as one of the accused, Sarah Shourd, had not been summoned to attend, he said. Ms Shourd returned to the US in September after being freed on bail. Her two co-defendants have been held in prison in Tehran since July 2009. They say they mistakenly entered Iran while hiking near the border in Iraq. Washington has repeatedly said there is no basis for a trial and called on Tehran to free the two men still in custody, Shane Bauer and Josh Fattal. The three friends were reportedly hiking in July 2009 in northern Iraq's Kurdistan region, near the Iranian border, when Iranian forces took them into custody and accused them of intentionally crossing over. They face charges of espionage and illegally entering the country, the lawyer representing the hikers' families, Masoud Shafii, has said. In September, Iran freed Ms Shourd, 32, on $500,000 (£310,000) bail on humanitarian grounds, citing concerns about her health.